What Is Happening? French President Emmanuel Macron supports policies to reduce climate change, and despite France’s already relatively low-carbon economy, has proposed further lowering carbon emissions through a fuel tax, as well as other measures such as incentives for people to buy electric vehicles. Macron’s carbon tax would raise an estimated 8 billion euros annually but create an only “minuscule global benefit.” It would also raise the cost of living in an already struggling economy, the bulk of which would be bared by rural and working-class citizens who depend on cars to get to work. Over the past few weeks, the “Gilet Jaunes,” or yellow vests, have angrily protested against the carbon tax and Macron’s perceived disconnectedness from his working-class and rural constituents. More than 260 people have been wounded, at least three have died, and more than 400 were arrested after violence sparked, rocks were thrown, tear gas was used, and monuments were vandalized. How Has The Government Responded? Bold environmental policies were at the heart of Macron’s political agenda when he rose to power 18 months ago, yet the riots are the latest episode highlighting his government’s underachievement on this front. While he has shown “little willingness to compromise” in the face of the protests, Macron’s government this week announced that it has suspended the tax for six months to allow for public discussion. Prime Minister Edouard Philippe said anyone would have “to be deaf or blind” not to see or hear the anger that led to the protests that rattled the capital city, and that “No tax merits putting in danger the unity of a nation,” leaving it an open questions as to whether or not Macron’s climate policies will have any traction with the French public, especially because opponents of the tax do not want “a delay,” but rather “the cancellation of the planned tax increase” altogether. What Does This Mean For Climate Agendas Around The World? The events in France demonstrate the complications for policymakers proposing climate agendas that voters do not believe justify polices that would raise the cost of living and hurt the economy, a trend that has been seen globally. In Canada, Ontario is suing to block a federal carbon tax, and in Germany the government’s planned transition to renewable energy is facing political difficulties. In the U.S., voters in Washington state defeated a carbon tax on the ballot this year that would have started at $15 per ton of emissions and increase by $2 annually. Additionally, despite building support from the incoming Democratic majority in Congress for robust action on a Green New Deal, the lessons of France’s carbon tax revolution is that voters need to support such action – which remains to be seen domestically thus far. What Does This Mean For Future Carbon Pricing Efforts In The U.S.? Carbon pricing appears to have been gaining traction lately, most recently with a bipartisan group of lawmakers in the House of Representatives introducing the first carbon pricing legislation in a decade. Yet, the Paris riots show that the cost of carbon pricing policies cannot be borne by the citizens least able to afford it. As organizations like the Climate Leadership Council have noted, the proceeds from such a carbon fee would need to be “returned to the American people” if the concept is going to gain popular support and keep the cost consumers pay for energy from skyrocketing. Others, such as the Alliance for Market Solutions, have argued that a price on carbon would need to be revenue-neutral and replace, not add to, existing regulations on pollution. 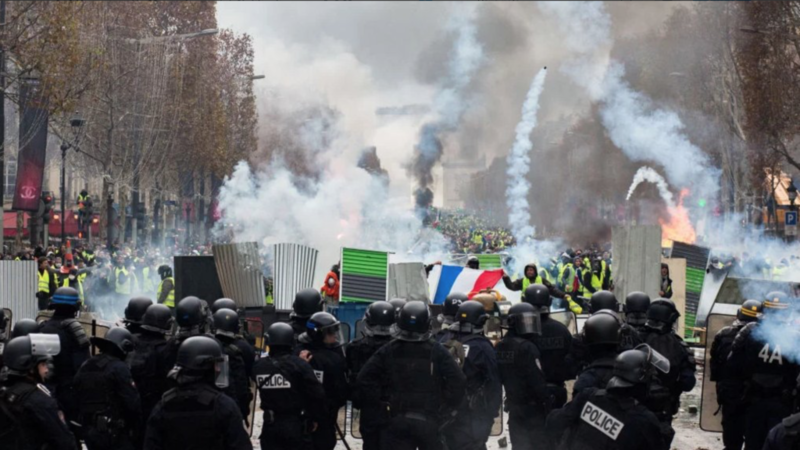 Either way, both proposals work toward addressing the underlying inequities driving the unrest in France, but they face stiff resistance from environmentalists like those pushing for a Green New Deal. While panic over climate change will continue to be a recurring trend, even though many of the most dire predictions have proved to be false, such alarmist predictions – and the pushing of aggressive policies to prepare for those scenarios that allow the brunt of the costs to be borne by citizens least able to afford them – result in too high a cost. To make progress on addressing climate change concerns, policymakers would do well to always have the Paris riots on their minds. INVESTING IN VICE OR VIRTUE? With the remarkable rise of environmental, social, and governance (ESG) factors in investing, you would be wrong to think that ESG couldn’t get much higher. In fact, the $8 billion socially responsible investment industry is having difficulty defining the burgeoning cannabis industry. As it has grown, cannabis is causing investors to grapple with whether it is similar to “sin” stocks that they try to avoid – like alcohol and tobacco – or, whether its medicinal purposes mean that it is an ethical investment. Depending on their particular criteria, ESG-focused investors are determining what companies they can invest in, especially because the “opportunity for growth is just too strong” to ignore. While ESG investors have laid out principles to position themselves as pure and socially-conscious, some of their actions are driven by what is currently on the political agenda they support. That was fine when “sin” industries were on the opposing side of that agenda but investing in cannabis poses a conflict they did not anticipate, a challenge companies trying to appease these investors have confronted all too often. Next week, the Federal Communications Commission (FCC) will vote on a measure that is meant to combat mobile phone spam including robocalls and spam texts, and as with anything the regulator does these days, it’s controversial. The measure comes after a letter FCC Commissioner Ajit Pai sent to the CEOs of major U.S. mobile providers earlier this month urging them to take steps to create a system to authenticate calls and end nuisance calls. Yet, in the wake of the hysteria surrounding the FCC’s repeal of net neutrality rules, Pai’s proposal to classify text messaging as an information service, rather than a telecommunications service, so that phone carriers can block spam texting, has raised concern from some consumer advocacy groups and at least one fellow commissioner, who fear the regulation could lead to censorship controlled by the providers. Regardless of the outcome of next week’s measure, the increasing public attention and criticism focused on curbing robocalls suggests that the public policy debate on this issue may become heated – and that heightened political and reputational risk is the new operating normal for the FCC. Securities and Exchange Commission (SEC) member Robert Jackson Jr. threw a wrench into Silicon Valley’s plans last week when he criticized a proposal for a “Long-Term Stock Exchange” (LTSE). The LTSE, which is a planned new public market designed to foster long-term growth for startups by awarding shareholders additional voting powers the longer they hold stock, has won support from prominent techies including venture capitalist Marc Andreesen and LinkedIn cofounder Reid Hoffman, and the Trump Administration has also signaled interest in promoting such long-term investing. According to Jackson, however, “Research has made clear that loyalty share structures often make it virtually impossible for investors to hold executives accountable.” Although opposition and wariness from institutional investors mean that the LTSE will not be approved at this time, the public conversation is indicative of a growing desire in the world of capital to move away from the breakneck, short-term incentives of most public markets and towards a culture of strategic, long-term investment. FROM DESIGNER GENES TO DESIGNER BABIES? The Director of the National Institutes of Health joined the rest of the scientific community last week in roundly condemning the work of a Chinese scientist who recently “created” the world’s first gene-edited babies. In a statement, the Director lambasted the experiment and other such “epic scientific misadventures.” The misadventure in question, though almost universally disavowed, may bear some positive fruit by hastening a long-overdue discussion in the scientific community: how can scholars or governments regulate science to enforce bioethical standards as technology develops? Some scholars want a central body to review experiments for ethical concerns, while others are seeking clearer guidelines for gene editing in particular, although the most relevant factor in any ethical standard will always be the character of the government involved. While the United States may establish strict rules tied to funding mechanisms in its own jurisdiction, regimes like China’s will enforce or relax restrictions based on the long-term goals of their ruling elite, posing continued operational challenges for companies that operate globally. Delve helps clients obtain and leverage competitive intelligence to overcome public affairs challenges in the political, policy, and business environments. Subscribe to TL;DR, our weekly blast that brings you news and insights from the competitive intelligence perspective.